Now's the time to plan that cross-country road trip. 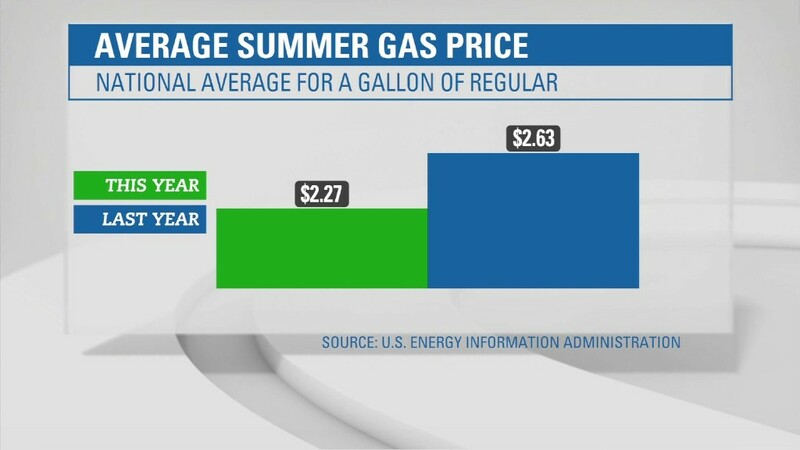 Summer gas prices haven't been this cheap since 2004 -- and there are growing signs they could slip even lower. As you might have guessed, cheap gas is being fueled by sub-$50 oil prices. But there's another hidden force at play: a serious oversupply problem. It seems that the well-chronicled glut in crude oil has spread to gasoline and other products. Despite the fact that it's the heart of summer driving season, the U.S. is sitting on 241 million barrels of gasoline in storage. That's the highest level for this time of the year since the government began tracking this metric in 1990. In fact, the only other times that gasoline stockpiles were this lofty were in the dead of winter, in early 2015 and early 2016, when Americans drive far less. That's music to the ears of American drivers. Nationwide, average gas prices dropped to $2.18 a gallon on Friday, according to AAA. Compare that with $2.32 a gallon last month and about $2.75 this time last summer. Tom Kloza, global head of energy analysis at the Oil Price Information Service, predicted that gasoline prices could soon dip below $2 a gallon for most of the country. "We're going to have a chapter of very, very cheap fuel," Kloza said. The excess gasoline sloshing around in storage tanks should also provide a nice buffer for consumers in case a major storm disrupts the energy industry this hurricane season. 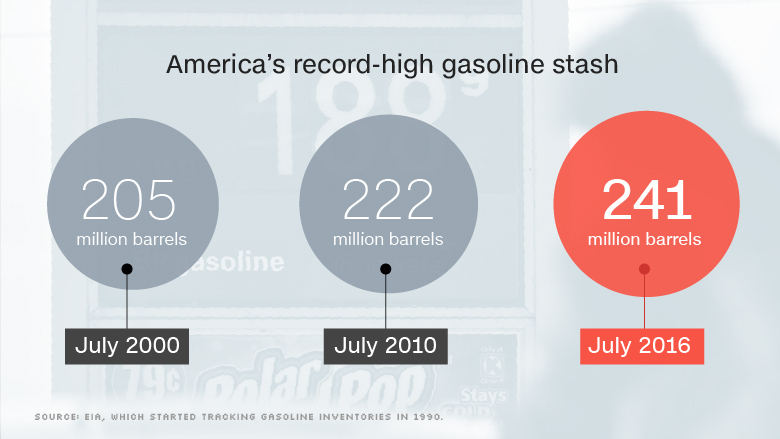 So why are gasoline inventories so high? It's not because there's less demand. Kloza said July was a record-high month as Americans guzzled on cheap prices by driving more. The problem is too much supply. The epic oil glut that briefly sent crude crashing to $26 a barrel in February has improved in recent months. Oil inventories have slowly declined from historic levels. But the surplus has moved into crude oil products, with refiners churning out more diesel, jet fuel and of course gasoline than is needed. "You're just turning one inventory problem into another," said Anthony Starkey, energy analyst at Platts Analytics, the forecasting unit of S&P Global Platts. And it's not just a U.S. issue. There is a global overhang of gasoline supplies weighing on global energy markets. The stockpiles have grown so large that Capital Economics commodities economist Thomas Pugh wrote in a recent note that there are increasing reports of diesel and gasoline being stored on ships at sea -- the most expensive form of storage. "The current glut in gasoline markets shows no sign of ending," JBC Energy wrote in recent a research report. The big fear among oil bulls is that more and more refiners dial back their production, easing the gas glut but worsening the crude oil one. That's why Pugh warns: "A sustained recovery in oil prices will probably have to wait until next year." No wonder, these worries about excess supply of oil products like gasoline drove oil prices down to $44.19 a barrel on Friday, their lowest close since early May.